We left Rome early in the morning on the 11th of July, 2009 and headed for Brindisi. The road from Rome to Brindisi was 570 chilometers long, a intense motor bike ride but still little compared to the total 1600 chilometers we drove during the holiday. Photos of the Greek Islands. The final destination was Kefalonia, in Greece and to get there we took a ferry from Brindisi to Poros. The Endeavor ferry boat was in a good shape and the trip went great. In total we spend about a hundred euros on fuel and visited quite a lot of places like Poros, Sami, Myrthos, Thassos, Skala, S.Efimia, Lourdaa, Ag.Thomas and Argostoli. We stayed in a studio appartment near Poros and every morning we drove off to explore new places and new beaches. Kefalonia was very pretty eventhough some prices were a bit high compared to other places in Greece. Did you enjoy Biking around the beaches of Kefalonia and have you been on a holiday in Kefalonia, Greece? The two bikers in Greece. Ready to hit the road in Greece. 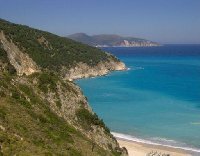 Pictures of the beaches around Kefalonia. Ready for a bike trip around the island, Greece. Motor Bike trip around Kefalonia, Greece. The beautiful beaches of Kefalonia, Greece. Photo of our motor bikes in Greece. Fuelling up in Kefalonia, Greece. Liked: The sea and the beaches. Disliked: Kefalonia was a bit expensive.